Listen to your Airport Passengers – Are They Happy? Some food for thought. Surveys are a key channel to gauge customer satisfaction in any business and airports are certainly not an exception. Collection of surveys data and its analysis is increasingly becoming a key need for airports. As per a recent report (Airport IT Trends Report, SITA) 89% of all airports will use Business Intelligence (BI) to conduct service quality data analysis by 2017. Some of the key airport survey analytics include the ACI ASQ Survey, Skytrax and others. Automated survey data collection brings in the boon of saved efforts that could be expended in doing manual data consolidation. It is not just a question of efforts but also about getting the insights fast so that the trends are recent and relevant. Once the data collection is done, the complexity involved in analyses needs to be tackled e.g., large data volumes, difficult to compute KPIs, different types of surveys and so on. This is where a pre-built airport analytics solution like GrayMatter’s AA+ brings in tremendous value through its survey analytics module. 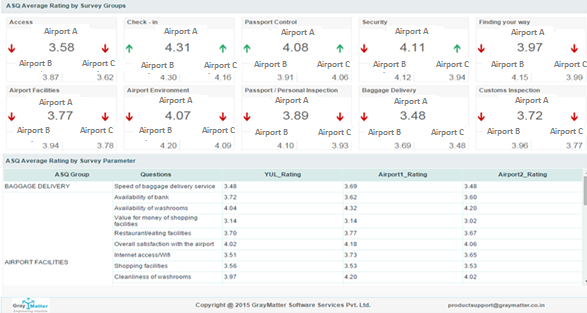 GrayMatter’s Airport Analytics (AA+) solution offers analysis of data across time periods and enables slice and dice by numerous parameters and so enables benchmarking and comparison of survey insights. The solution intuitively provides drill down to the root cause of the problem and triggers the right solution approach. The solution offers detailed analyses of the business, have a look at the dashboard below for instance. The upper half of the dashboard shows how Airport A is faring across several factors (survey groups) and how its performance is compared to Airports B and C. The red and green indicators provide a quick performance benchmark. In the lower half of the dashboard each of the survey groups are drilled down to questions. Ratings are recorded for each of these questions, this illustrates what I was talking about when I mentioned detailed analysis. By Graymatter| 2018-01-16T12:50:13+00:00	February 4th, 2016|Airport Analytics, Uncategorized|Comments Off on Listen to your Airport Passengers – Are They Happy?